Argan Oil has been made for hundreds if not thousands of years by the native inhabitants of Morocco, the Berbers. In particular the Tashlahate ( Tashelhit ) speaking Berbers of the “Souss” who occupy lands between Marrakesh to the north and just south of Agadir and from the west coast over towards the Algerian borders. The Argan trees grow mostly towards the low coastal areas and in the mountains south of Marrakesh. Traditional preparation of Argan Oil by Berber women was a very labour intensive affair with low production yields. This made commercial sale of Argan Oil outside of Morocco impossible. Argan Oil co-operatives have now made large scale production this possible. Argan trees are grown on small and large plots of land that have been owned by families for generations. When the Argan fruits ripen in June / July the fruits are picked and left to dry before being stored in large sacks. The nut kernels removed from the nuts and ground, by hand, using a grindstone. Water added to produce an oil-rich dough which was was then squeezed to extract the Argan Oil. This was a very labour intensive process and it would take about 1 week and about 20kg of Argan nut kernels to produce 5 litres of oil. Until the 1990’s there was little international interest in Argan Oil and export volumes were low. Traditional processing was sufficient to meet demands. But, as worldwide interest in Argan Oil grew foreign investors came to Morocco seeking to cash-in on this newly discovered resource. They built modern cold-pressing plants far away from the Berber Argan forests in cities like Casablanca. Modern pressing machinery enabled them to produce a higher quality oil with a lower water content and longer shelf life at a lower price. 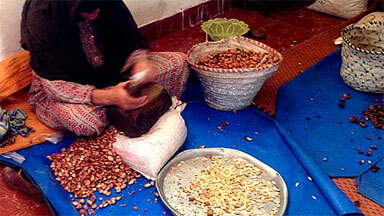 The role of the women of the Berber communities was reduced to little more than a supplier of raw Argan nut kernels. By early 2006 there were an estimated 16 private pressing plants owned by foreign investors. Little of the profits from these Argan Oil producing companies found its way back into the communities. To help Berber communities compete with the foreign owned pressing plants a number of NGOs from Europe began to support the development of Berber women’s cooperatives with funding for new mechanical presses and dedicated buildings where farmers could bring their Argan produce for processing. Government and foreign agencies also paid the considerable costs of getting internationally recognised organic certification for the Argan forest and the oil produced. Now families are able to taken their crop to one of the many Berber women’s cooperatives where the process of cracking the nuts is done communally by large groups of women and the pressing of the oil done by a modern cold pressing machine. Argan Oil expert Professor Zoubida Charrouf worked with the Argan Oil Cooperatives for many years. As a professor at Mohamed V. University in Morocco, she developed an interest in the Argan tree. Not only the use of its precious oil for skin care and for health but also with a passion for conservation of this natural resource. When the project started, Morocco was losing more than 600 hectares of Argan forest each year. By teaching people the value of their trees the professor was able to develop a new found respect for their valuable forests. Where once Argan tree wood would be stripped to produce charcoal and animals would graze the trees farmers are now beginning to plant new trees, fence off and protect valuable forest and take good care of the trees. Projects were started that improved the extraction of oil by involvement of the Berber women in establishing oil producing cooperatives. By bringing a more business like approach to the Argan Oil cooperatives Professor Charrouf helped to boost both production levels and the quality of oil. The increased productivity allowed the women’s cooperatives to compete on an international market and to keep up, and benefit from, the growing demand. Not only did this bring much needed income to the cooperative and families of the region but at the same time it has emancipated the women by offering them a real, sustainable living wages. Cooperative members now earn around 75 Dirhams/$8.60 a day( 2013), an increase of more than ten times from when the projects started in 1997 and this is a real living wage. Literacy and numeracy programs as well as better access to health care have brought a new freedom, a higher standard of living. As a cooperative member explains: “. “Being part of the women’s cooperative freed me from tedious domestic work in people’s homes,” said one co-operative member. In Morocco, even until very recently, it was not considered necessary for Berber girls to complete or even attend schooling. Tradition decreed that the destiny of girls was marriage. Increased literacy sponsored by cooperative system in Morocco allows the Berber women more power and independence. Even older generations have been keen to take up the new opportunity to learn literacy and numeracy. Studies undertaken to compare the health of illiterate and literate Moroccan Berber women in Holland. In the control groups, which were compared for age, work and partners, it was found that literates people enjoyed significantly better health. You can buy certified, organic Argan Oil directly from some of our web pages where you see the “add to cart” buttons. You can also find our range of products on our online store.